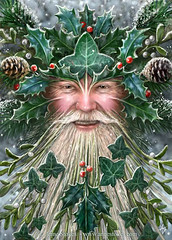 In truth I only celebrate Christmas because of my family; I actually celebrate Yule, the Winter Solstice, but talking of the festivities as Christmas is easier than explaining (or getting into an argument with someone ignorant and blinded by their religion that they are unable to accept others may have different views on faith). In short, mine is a nature based faith, as learned from an important family member who is no longer with us (oh, the secrets we hid). So for me, today is my winter celebration and the next turn of nature's wheel. Days begin to get longer and the earth is deep in slumber preparing for the spring. The date varies between December 21 to 23 each year in the Northern Hemisphere; this year it will be 22 December at 05:30. 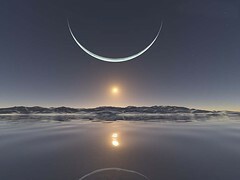 So I will celebrate this evening for "Winter's Eve"
There is much evidence of the solstice being celebrated for thousands of years. Worldwide, interpretation of the event has varied from culture to culture, but most cultures have a recognition of rebirth, involving holidays, festivals, gatherings, rituals or other celebrations around that time. Since the event is seen as the reversal of the Sun's ebbing presence in the sky, concepts of the birth or rebirth of sun gods have been common and, in cultures using winter solstice based cyclic calendars, the year as reborn has been celebrated with regard to life-death-rebirth deities or new beginnings such as Hogmanay's Redding, a New Year cleaning tradition. In Greek mythology, the gods and goddesses met on the winter and summer solstice, and Hades is permitted to enter Mount Olympus (his domain is the underworld so he does not get accepted any other time). I didn't know that the winter soltice date was moveable, thank you for that and for that wonderful photo. I will think about the Soltice this evening as well as yesterday! Don't you just love to learn something new?